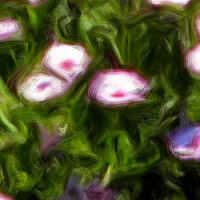 This is a collection of digital paintings created from original digital photographs. Each image is cropped for composition, scaled to 2048 pixel width, and then processed with a painting program. My current favorite is Corel's Painter. 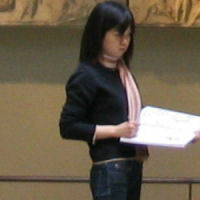 The majority are done in a classical painting style, with visible strokes and bristle marks. The color pallette depends on what works best for a given image. It may have increased or decreased contrast, increased saturation, or a shift in color intensity. 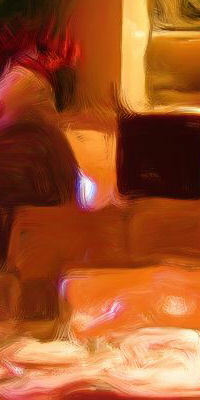 Modernist and Impressionist pallettes are also used in some cases to create more striking images. Most of the collection is provided in two resolutions. Click on the dimensional choices after 'Size' to select a medium or large format image. A few of these have been taken fro0m one of the Beautiful Images collections at The Other Pages, but the vast majority are new. Good source photos are ofted a little more cluttered to give detail and color highlights. This is also a good 'anonymizing' technique. If you've taken a great picture, except for the unfamiliar people in it, running it through a painting program converts 'strangers' into something more like an 'impression' of a person. By the way, if you do plan on using such a program on a personal portrait, start with a large image to minimize the sometimes unpleasant randomness of brush strokes. An odd stroke through tree branches mak look OK, but through a nose or an eyebrow can give an unsettling effect. Click HERE or select one of the page numbers in the left column to get started. and are for personal or non-commercial use. All Web content © 2009 TheOtherPages.Org; All rights reserved world-wide.